Not a musicologist over here, just a fan of Debussy's opera. Having seen & heard the other 3 DVD versions available of Pelleas (Gardiner, Boulez & Andrew Davis) -- they all have their merits, but none succeed as a recorded document of an excellent live performance as well as this Welser-Most version from Zurich. As an audio performance, this Pelleas rates with the best I have ever seen or heard in the house or on CD. Welser-Most gets the better singing out of the best cast. His conducting may be a matter of taste for many of you, but I personally like it very, very much. Isabel Rey, Michael Volle, Rodney Gilfry, Cornelia Kallisch & especially Laszlo Polgar are vocally perfect for their roles and all give first-rate, musicianly performances. Whether you like or do not like the staging and the sets again is a matter of taste. I prefer it to all the others I have ever seen -- like Debussy's music, this staging reveals much more of the subconscious motivations of the characters as they grapple with desire and destiny. The other Pelleas DVD stagings seem static and uninteresting compared to this one. This recording is state of the art. The piece is in a dream-like state. The strange nature of Pelléas et Mélisande and the accordingly strange production staged here for the Opernhaus Zürich in 2004 undoubtedly have much to do with the nature of the source work for the opera, a symbolist play by Maurice Maeterlinck that relates less to the conventions of narrative cause-and-effect drama, but more to the internal states of the characters being made manifest in the world around them through objects, environments and landscapes. As such Pelléas et Mélisande is not an opera that needs to be tied to any specific period - unless a director specifically wants to make a specific statement - and to tie it to a particular time or place is likely to create social/environmental meanings that may be contrary to the intention of the piece. This means that the opera can either be set in that vague non-time-specific no-man's land that opera does so well, or, rather more controversially, it is open to rather more extreme interpretations. The staging here by Sven-Eric Bechtoff consequently can be seen as being either wilfully bizarre or just perfectly suited to the unusual nature of the opera. There is more going on between the characters than is evident on the surface, each of them having hidden natures, each of them unable to fully relate to or communicate with one another. As a means of bringing this out, Bechtoff places the characters in some kind of winter fairy-tale kingdom to emphasise the nature of their isolation, while he employs full-size look-alike dummies for each of the characters to act as doubles for them, the characters more often speaking to the dummy counterparts and pushing them around in wheelchairs than relating to the actual people. It all seems rather obvious and it's tempting to see the device as just an expression of how people are puppets being used by others for their own purposes, but that is also too obvious and, in a symbolist work where there is just as much emphasis on objects - hair, rings, towers - it's appropriate that the characters are objects themselves (the split into halves indeed being the original definition of symbolism). In this light, and on a non-rational basis, what appears to be a bizarre conceit proves to be uncannily effective, and when the characters do communicate directly with each other - as opposed to interacting with dummies - it does force you to take more notice of what is being said. How much you will buy into this depends largely on your tolerance for high-concept modern stagings and how much credence you give to the symbolist movement, since other than perhaps in the film work of Antonioni and his disciples, their style doesn't have a great deal of relevance or influence and is not held in great regard nowadays, certainly not from a literary viewpoint. It's important to note however that the staging is not a distortion of the intentions of the opera on the part of the producers, but rather, if it doesn't adhere to the letter of the work, it is nonetheless perfectly in keeping with the spirit of it, and certainly matches the spirit of Debussy's musical composition. Making use of a revolving stage, the production is certainly effective in its dreamy fluidity, but it's also exceptionally well sung, particularly by Rodney Gilfrey as Pélleas, but Isabel Rey as Mélisande, Michael Volle as Goland and László Polgár as King Arkel are all marvellous. The orchestra playing is superb, particularly in the excellent High Definition sound reproduction on the Blu-ray. Leaving aside the fact that the musical aspects of this Zurich Opera production of Pelléas et Mélisande are more than acceptable, the stage action and setting are so off-putting as to make this an untenable proposition. First a word about the music: Franz Welser-Most leads a knowing performance, getting lovely subtlety from both orchestra and singers. 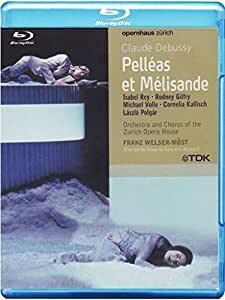 Pelléas is the marvelous Rodney Gilfry, Mélisande the equally effective Isabel Rey. Laszlo Polgar is a particularly good Arkel, Michael Volle only slightly less good as Golaud. Cornelia Kallisch is fine as Geneviève. But the mise en scene is, uh, stupid, if you'll pardon my saying so. First, there are three-quarter-sized manikins that are doubles of the major characters, and the main characters, when addressing each other, most often address the manikins rather than the singer of the part. I suppose this is intended to convey some sort of psychological isolation, but frankly it comes across as pretentious and unconvincing. The characters often carry their manikin, or drag it around. From time to time the characters are in wheelchairs, or their manikins are; again, presumably this indicates the characters are all handicapped or flawed in some way. Couldn't we just let Maeterlinck's words tell us that? The setting seems to be a land of eternal snow -- psychological coldness, get it? -- and unvarying shades of white, gray, ugly green. Why? This is an example of Regietheater gone mad. When there are other DVDs of Pelleas out there, and with equally good singers and orchestras, and in traditional or at least less bizarre productions, I'd strongly suggest you pass this one by. Si bien las interpretaciones de los cantantes y de la orquesta son correctas y bien llevadas la "mise en scene" deja mucho que desear. Escenarios inapropiados, vestuarios completamente neutros e inadecuados y sobre todo movimientos absurdos de los solistas empujando sillas de ruedas con maniquies representandose ellos mismos o a los otros personajes. Se desvirtua totalmente la belleza poetica de la obra de Debussy. La modernidad llevada hasta extremos absurdos. Es decir, fastidio total.